Dopo essere stato rimandato di 6 mesi a seguito della tragica morte del produttore Jerry Finn, "Years Of Refusal" � il decimo album solista di Morrissey e contiene nuove canzoni molto intense come "Something Is Squeezing My Skull", "All You Need Is Me", "I'm OK By Myself", "Mama Lay Softly On The Riverbed", "I'm Throwing My Arms Around Paris", "Black Cloud" e - con Morrissey che si appresta a compiere 50 anni - l'appropriata "One Day Goodbye Will Be Farewell". Il titolo del nuovo album viene forse da un incontro che Morrissey ha avuto nel 2004, quando cur� il Meltdown Festival al Royal Festival Hall di Londra. Morrissey aveva avvicinato la grande scrittrice americana nera Maya Angelou perch� partecipasse al Festival. Morrissey ha utilizzato la poesia "No No No No" nella colonna sonora dei suoi concerti al Millenium di Los Angeles. Cos�, forse, il titolo del nuovo album � stato ispirato dalla famosa poesia della Angelou intitolata "Refusal", che termina con i commoventi versi: "Sfido la fretta del mio corpo. Senza la promessa di un incontro pi� dolce, non mi degner� di morire." 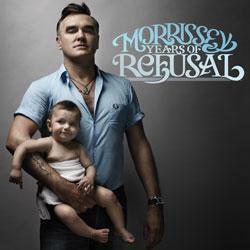 After being delayed six months following the tragic death of his producer Jerry Finn, "Years Of Refusal" is Morrissey's tenth solo studio album and features strong new songs including "Something Is Squeezing My Skull", "All You Need Is Me", the auto-sexual "I'm OK By Myself", "Mama Lay Softly On The Riverbed", "I'm Throwing My Arms Around Paris", the ominous-sounding "Black Cloud" and - with Morrissey approaching 50 in May - the appropriate "One Day Goodbye Will Be Farewell". The new album title maybe comes from a meeting that Morrissey had in 2004, when he curated the Meltdown Festival at London's Royal Festival Hall. Morrissey had approached the great black American writer Maya Angelou to appear. He's featured her poem "No No No No" on the soundtrack before his solo shows at the end of the Millennium. So, maybe, the title of his new album has been inspired by Angelou's famous poem "Refusal", which ends with the moving lines: "I defy my body's haste. Without the promise,/Of one more sweet encounter, I will not deign to die."